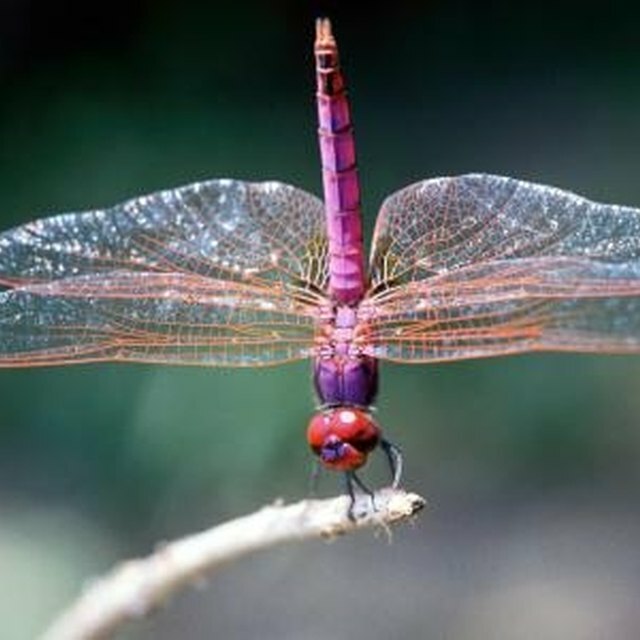 Dragonflies are beautiful, colorful, winged insects that can grow to be up to 4 inches long. It is fascinating to watch them grow from aggressive larvae or nymphs to adults. Although it is as exciting to see the nymph change to a dragonfly as it is to see a caterpillar turn into a butterfly, keeping dragonflies as pets presents challenges. Without ample room to live, a dragonfly lifespan of several years shortens significantly due to the confines of a small environment. Obtain dragonfly larvae or nymphs in a local bait shop. Nymphs are popular with fishermen for use as bait. By purchasing nymphs at the bait store there is no question of the dragonfly's species, as opposed to guessing and taking nymphs from a pond. There will always need to be more than one nymph if the buyer wants to breed the adult dragonflies. Use a 10- to 25-gallon aquarium tank for the nymphs, depending on how many adult dragonflies are wanted. Fill the tank about halfway with water. Remove chlorine and other water additives that could harm the nymphs, according to the directions on the bottle of chlorine remover. It is usually a certain number of drops to each gallon of water. Keep the tank with some natural algae in it that will multiply, but do not let it become overwhelming. Place algae-eating snails or an aquarium sucker fish, such as plecostamus in the tank to remove excess algae. Ensure any sucker fish introduced to the tank is at least several times larger than the nymphs, so it stays off the nymph dinner menu. Put items into the tank that may be found in the nymph's natural habitat: large rocks, gravel, lily pads and artificial water plants. Nymphs are aggressive hunters. If small fish get put in the tank, the nymphs will hunt them. Unless the intention is for the fish to become food, they should not be put in the tank. The items placed in the tank are essential to the dragonflies being able to emerge from the water when the time is right. Feed the nymphs mosquito larvae, tadpoles, blood worms, small fish or other water insects. All of these are available in bait stores or aquarium supplies. It may be shocking watching the nymphs pursue their prey, considering how docile and beautiful dragonflies are once they mature and leave the water. Maintain water levels and food supply until the nymphs emerge from the water onto a rock or plant. It takes some time for them to spread their wings in the tank. A mesh lid on the tank is necessary to protect the dragonfly or dragonflies from escaping. Give the dragonfly the run of the tank. Maintain a supply of insects in the tank to allow the dragonfly to hunt. If keeping dragonflies as "pets," a larger tank should be considered allowing the dragonfly to have some freedom. Allow the dragonflies to stay in the same tank for the purposes of breeding, if that is the basis for raising them. Females lay eggs in the water. By the time the next generation has hatched and emerged from the water, caring for the dragonflies will be old hat. Keep in mind, however, that an aquarium tank will take only so many dragonflies; it may be necessary to move them to a larger tank at some point. Think about releasing adults in a marshy area, or near a pond, after nurturing them to adulthood. Releasing them makes room in the tank for observing yet more nymphs become adults and giving the captive dragonflies a taste of real freedom. Biondi, Nadelee. "How to Grow and Raise Dragonflies in a House Box." Sciencing, https://sciencing.com/grow-raise-dragonflies-house-box-10045808.html. 10 March 2018.